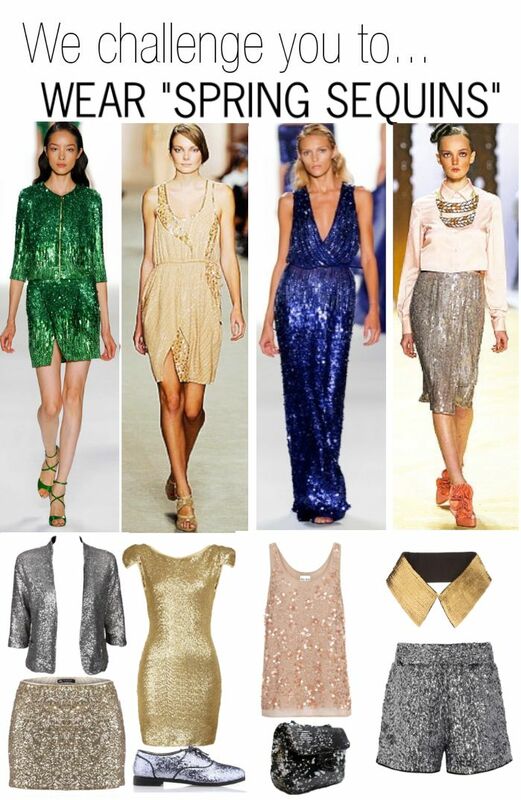 We challenge you to... wear SPRING SEQUINS! What's "I challenge you to..."? It's bi-weekly special where we (Flor de Maria Fashion, Ashes into Fashion and I) challenge our readers and bloggers around the globe to wear specific trends or themes- and we would love if you could join us. Every other Monday, we'll publish the the challenge, so you have two weeks to plan your outfit and wear it. Then, that following Sunday: we'll show you how we wore the trend/theme and you'll be able to share your link & outfit with everyone. This time we challenge you...to wear sequins during the spring-time. Regularly, when I think of sequins... I think about the Holiday season. Reason why this is definitely a challenge for me! ARE YOU READY!!? Esta vez te retamos a lentejuelas durante la primavera- generalmente las relaciono con la Navidad y fiestas decembrinas, razón por la cual es te es un gran reto para mi. Adorei a nova TAG. estou ansiosa por domingo!! Ooh, I love sequins! I think I might be up for the challenge! I have the perfect vest for the challenge. yes please...I already have an outfit planned!! :) Yo también lo relaciono con algo muy festivo e incluso recargado, es un reto interesantee a ver que me sale, espero que bien! Muy buena idea! Me gusta!